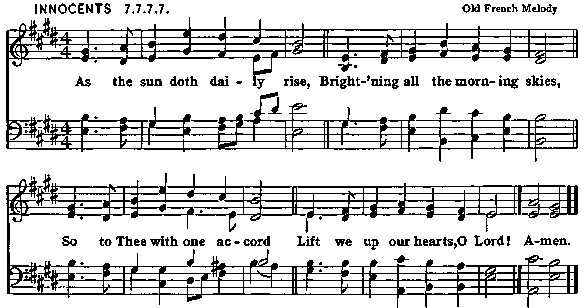 2 Bark and cheerless is the morn, Unaccompanied by Thee; Joyless is the day's return, Till Thy mercy's beams I see: - Till Thou inward light impart, Glad my eyes, and warm my heart. Pierce the gloom of sin and grief; Fill me, Radiancy divine, Scatter all my unbelief: More and more Thyself display, Shining to the perfect day. For from Thee come all things good: Strength unto our souls afford From Thy living Bread, O Lord! 4 Quickened by the Spirit's grace All Thy holy will to trace, While we daily search Thy word, Wisdom true impart, O Lord!